I saw Ben Affleck first time in a movie was 'State of play'.And to be frank i didn't noticed him.It was obvious because it was a Russel Crowe movie.And no one saw him coming.Then i watched 'The Town' last year only because i heard it was a bank robbery movie.Once i watched the movie,i was very much impressed and was surprised to know the movie was directed by none other than the lead actor Ben Affleck.Now comes 'Argo' the surprise winner of the year. The movie is a dramatization of the 1980 joint CIA-Canadian secret operation to extract six fugitive American diplomatic personnel out of revolutionary Iran.The CIA agent Tony Mendez made a rescue plan which was never tried before.His plan was to create a fake film crew and use it as a cover to bring the hostages back.For that he has to start from the scratch.He even hired an Oscar winner make-up artist!. 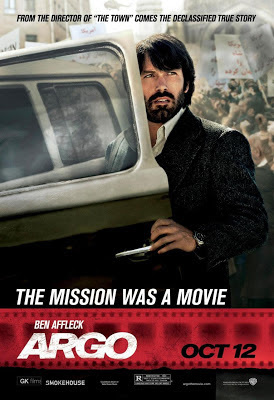 'Argo' is brilliantly written and directed with small bits of cinematic modifications on the real story.Brad Pitt was first cast as the CIA agent,but he couldn't do it because of other projects.Then Ben Affleck himself had to do it.And it has turned out as one of the biggest movie of the year. The movie won awards for 'best motion picture' and 'best director' in Critic's choice awards and Golden globe awards.So sad it is not nominated for Oscars.Otherwise it would've been a sure shot winner.So movie lovers,it's a must watch movie and don't miss it.